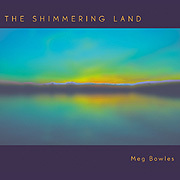 The tonal substance of The Shimmering Land (60'10") is made using synthesizers. On her sixth album Electronic Musician Meg Bowles realizes an atmosphere of ageless quiet, with six dreamy ambient tracks energizing in a unique way. From a lost, haunted and deeply affecting melancholy, to a bright and hopeful radiance, The Shimmering Land provides lasting reverberations. Enigmatic and limitless her work is about texture, and moves in waves. A noted development in Bowles' music is the inclusion of the occasional slow sequencer pattern which produces a measured motion akin to flow. This addition provides a wonderful sense of gentle propulsion, which moves us along a pleasant compositional arc - to beautiful sonic states. As Bowles charts the inner map her restrained poetic minimalism enters a still subtle place. A typical listening experience involves an ethereal slow dance of tones, simply and eloquently rising and receding in long lines of diverging electronic pads. Deep bass notes expand beneath rounded synth-strings - surfacing, touching, and then brightening. Between the two float quietly plucked blips moving at an unhurried pace. Each track is distinctively evocative - a tender montage leading the listener quietly into the night. Over the decades this music has become more sophisticated, and so has its listeners. Easy to label, hard to define, The Shimmering Land is not trying to reinvent New Age or Spacemusic, it is an attempt to make this kind of music as good as it can be.